Whenever I write about our home office I get a very genuine sense of deja-vu. Like I’ve been “finishing” this space for the last 4 years and it’s never-ending and I never quite get over the line. Is anyone else like this? I describe it as the 90-95% completed project. In my head, it’s finished so I don’t bother doing the last few little bits. But NO MORE! Iconic Lights are one of the very lovely companies helping me to get over the finishing line with this room. Before I show you how though, let’s backtrack a bit. Our home office was one of the first major projects we worked on, turning it from tiny 4th bedroom into the perfect his n hers office. Roll around last summer and the grey we originally chose to paint was looking a bit pigmented after 4 years so I decided to paint it again, in a different dark grey during that ridiculously hot weather we had. 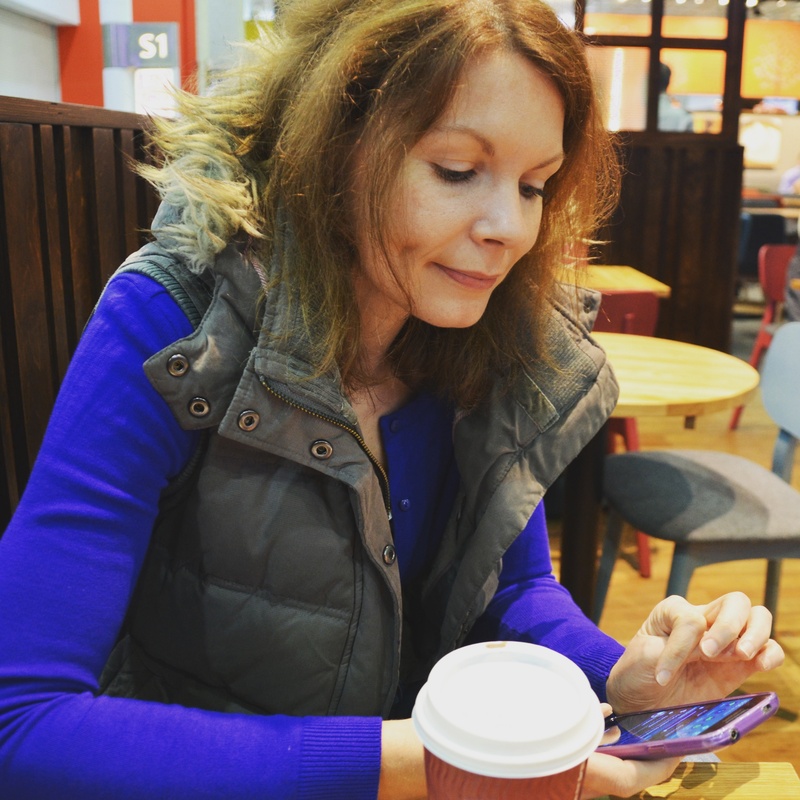 I still don’t know if it’s because I was a in a rush or because it was so hot but the paint job I did was rubbish and we never really fully moved back in to this space. So now I have some extra time on my hands, I decided to give it the coat of paint it deserved and it’s amazing what a difference its made. We’ve filled the shelves and hung pictures on the walls. One thing was missing though and thankfully Iconic Lights came to the rescue. 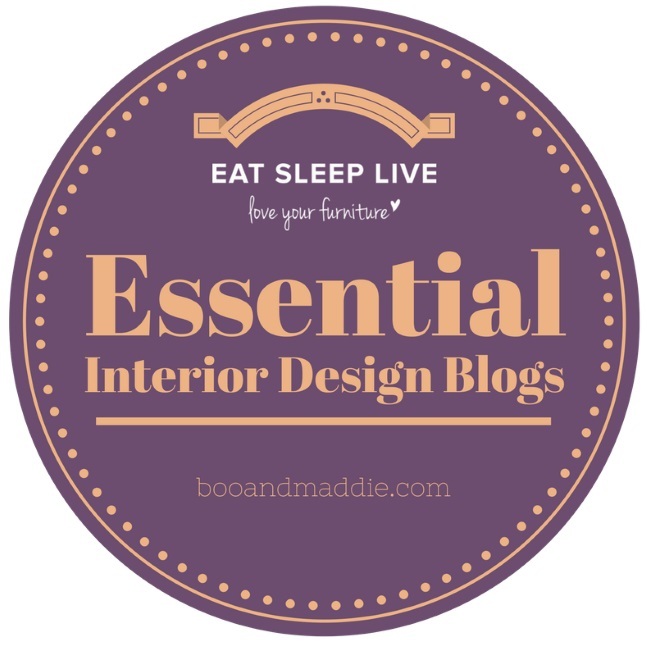 It’s so exciting to work with them again after I was one of their brand ambassadors way back almost when I first started the blog. 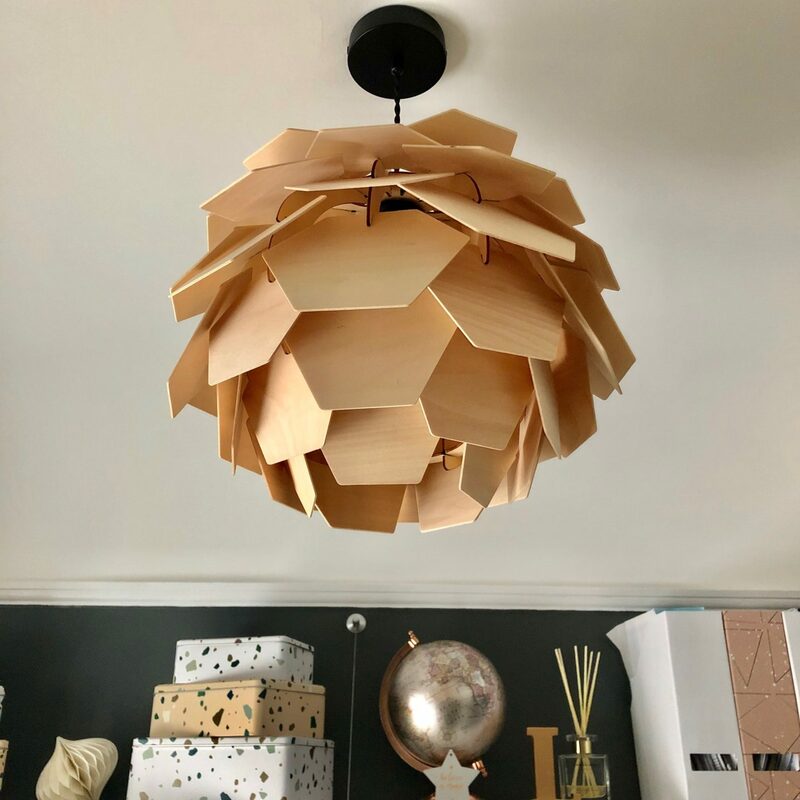 We still have a number of lights and shades from Iconic Lights dotted around the house and I knew they’d have the perfect piece for our ceiling pendant. 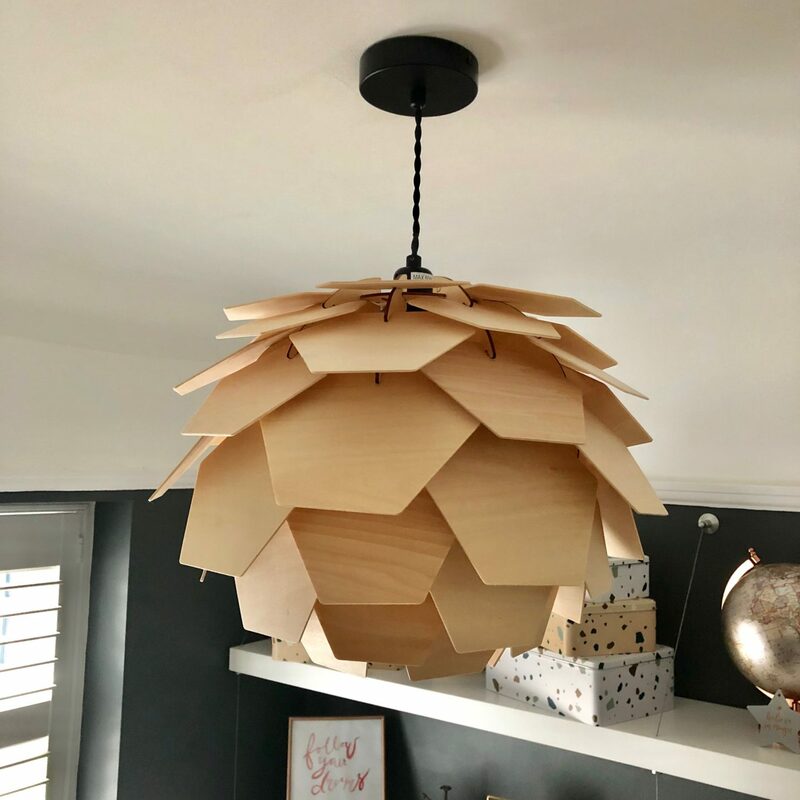 I’d first spotted an unusual plywood lamp over on the wonderful Instagram account of Emma, Apogee Interiors. Whilst I know we didn’t need another floor-standing lamp, a quick search of the Iconic Lights website showed that they had them in pendant form too. 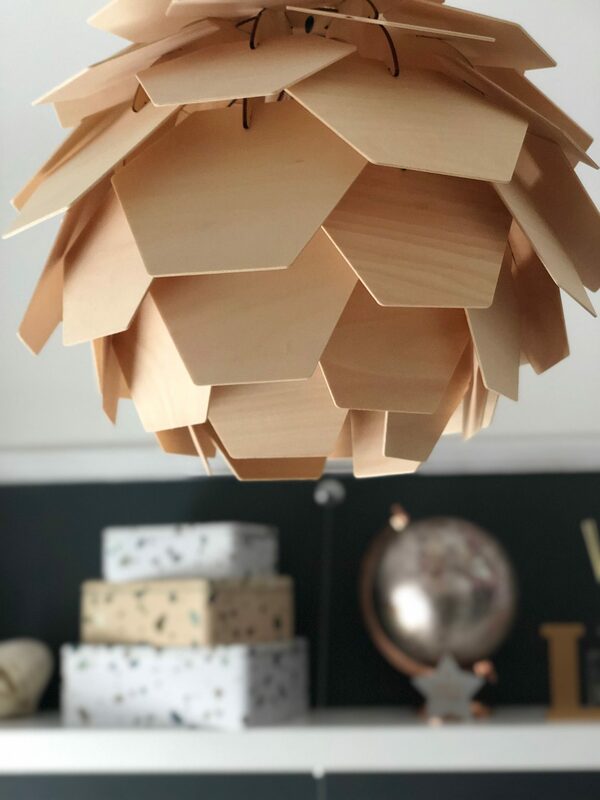 There’s so much about this piece that I love – it feels so raw and natural in its plywood form plus it comes unassembled and my inner jigsaw geek immediately got excited about piecing it all together. It’s honestly so much easier than it looks and if I hadn’t been stopping for stories every few minutes it would have been done inside quarter of an hour. 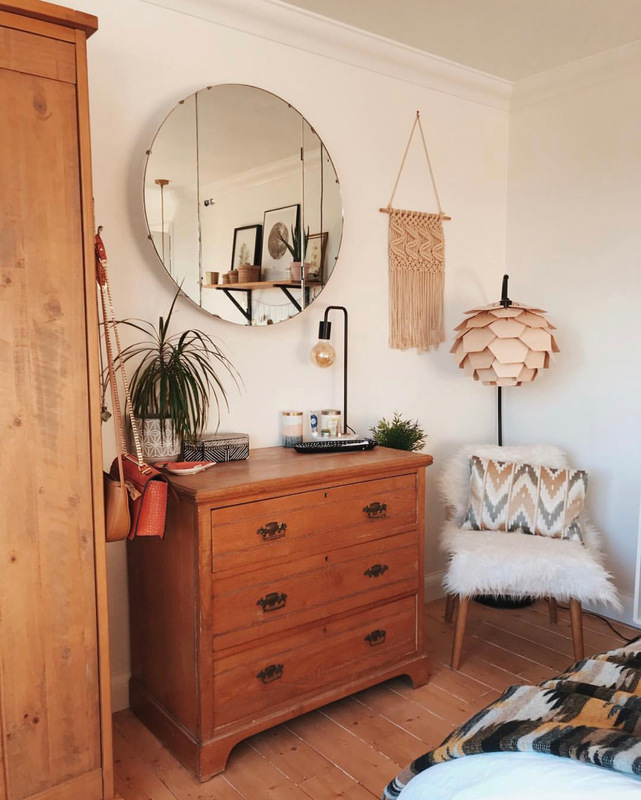 The finished item looks so stunning although we were a little dubious as to whether it might be too big for the room – honestly our littlest bedroom is properly small. Thankfully though it looks absolutely perfect and has created a real statement piece in our home office now. 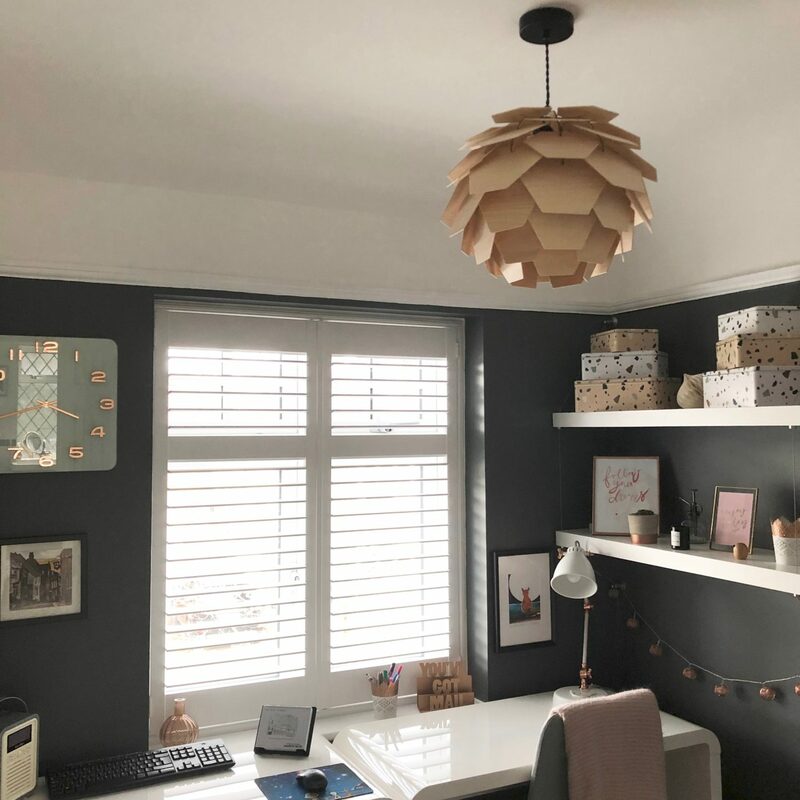 The natural colours of the plywood suits it down to the ground with my colour scheme of dark grey mixed with copper/blush/cream accents and Pete did a fantastic job of fitting a new ceiling rose and flex that he found in Dunelm to replace the uninteresting white one we had. It also gives off the most warm beautiful glow at night-time too. 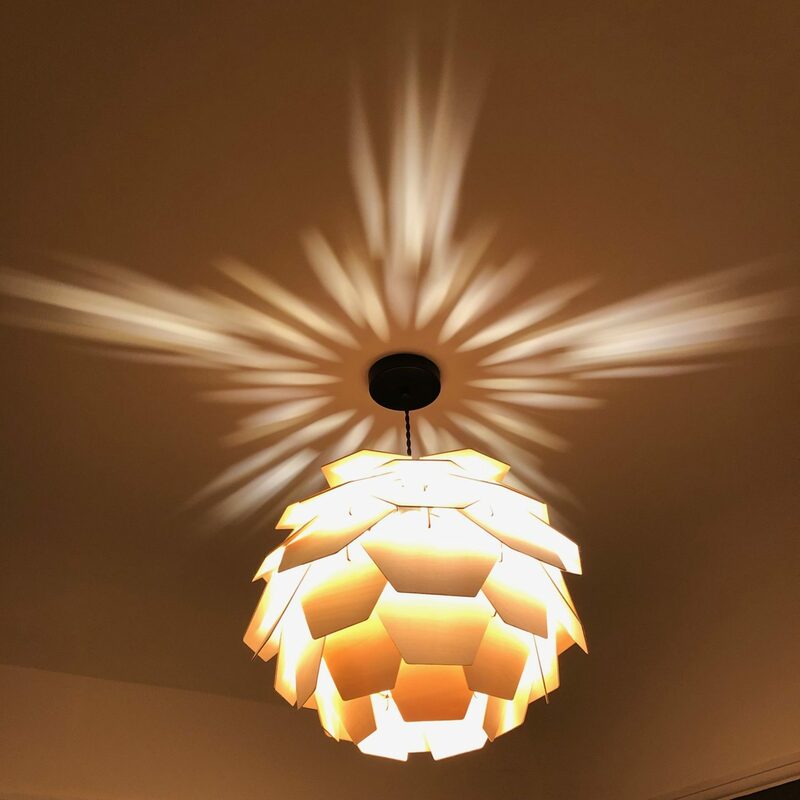 We don’t really use ceiling lights that often but when we do it’s always fun to have something which creates a bit of interest. 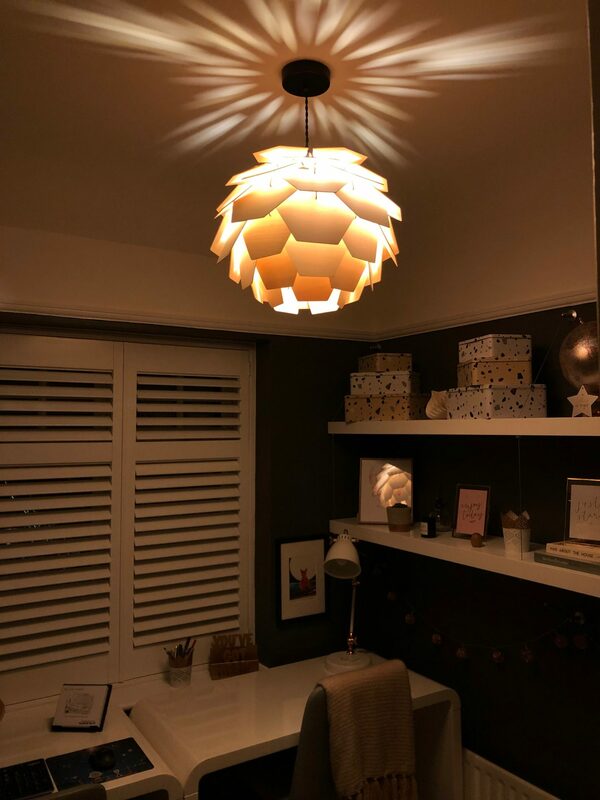 With this Artichoke Pendant shade, because of how the pieces fit together it creates the most glorious shadow effect adding even more character to our little space. 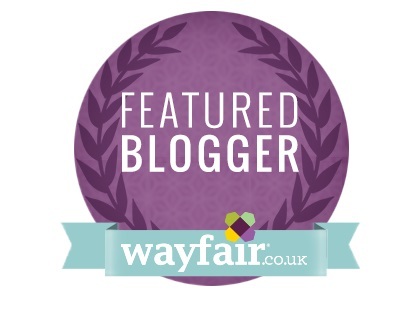 I’m over the moon and we’re SO nearly there now I can smell this room being finished and hopefully a blog post all about that coming very soon! 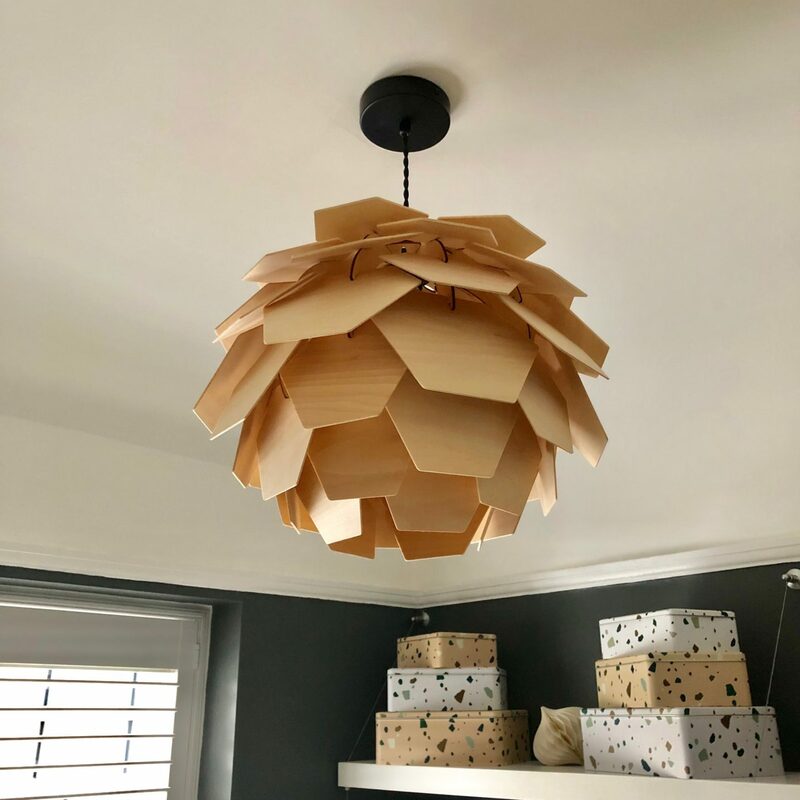 Disclaimer: This is a gifted post with Iconic Lights who kindly provided the Artichoke Plywood shade free of charge. I have worked with Iconic Lights before and only collaborate with brands that I love and/or think you would too! Your office space looks great. The attention to detail is spot on. Great work! Thank you so much for your kind message!